The Amazon Kindle was originally designed to let you read for weeks on end on a single battery charge, but as with most consumer electronics that idea went by the wayside once it got into customer's hands. We've seen Kindles hacked to act as second monitors, stream video, be a weather station, and even play video. 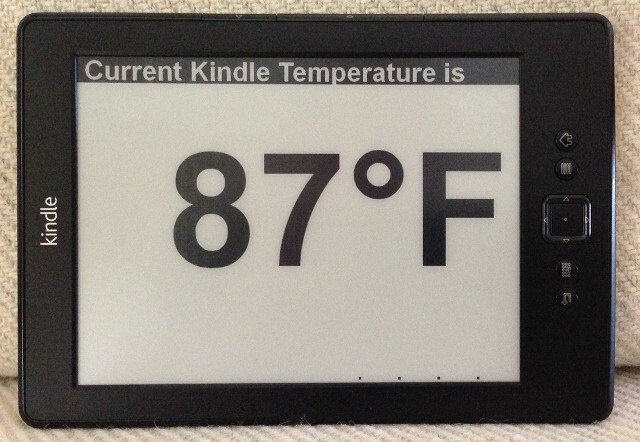 And now one enterprising hacker has come up with a way to use a $79 Kindle as a thermometer. The hack requires nothing more than a jailbroken Kindle and some software you can find on GitHub. The software has to be installed on the Kindle, and it displays the temperature in Fahrenheit or Centigrade. There's no need to add any sensors, and that's because this hack uses the temperature sensor which is built into the CPU. The Kindle runs on a Freescale CPU, and that sensor is intended to monitor the CPU so it can shut itself down if it overheats. And since the CPU spends most of its time in standby, the temp sensor is going to return a value that is close to ambient air temperature in the room. Or at least that is how it is supposed to work; I'm not fully convinced that the CPU won't be running a couple degrees warmer. If you would like to try the hack yourself, the code can be downloaded from GitHub.